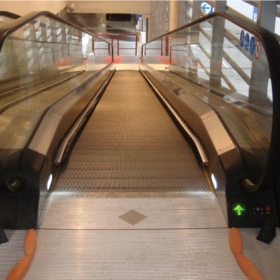 The T family of inclined moving walkways is ideal for delivering vital access over different floors for customers and their shopping trolleys in private facilities, such as shopping centres. Reliability and safety are our priorities and all systems are compliant with the EN 115 regulation. This ensures maximum safety for passengers and managers. Commercial T12: (12°, horizontal run only at the upper landing: 400 mm) vertical rise from 2 to 8 metres. Streamlined and flexible in design, the T inclined moving walkways offers a full range of optional design features for easy integration into your building and leave plenty of room for architectural expression. Want to find more about T inclined moving walkways? Looking for a reliable system for your supermarket? Looking for a inclined moving walkways for your facility? Contact us for a personalised quotation!